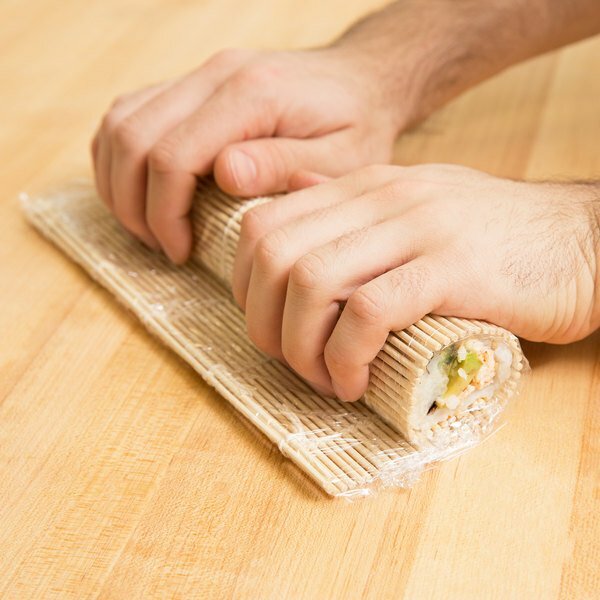 Make skillfully-shaped sushi rolls with this 9 1/2" x 9 1/2" rounded bamboo sushi rolling mat! 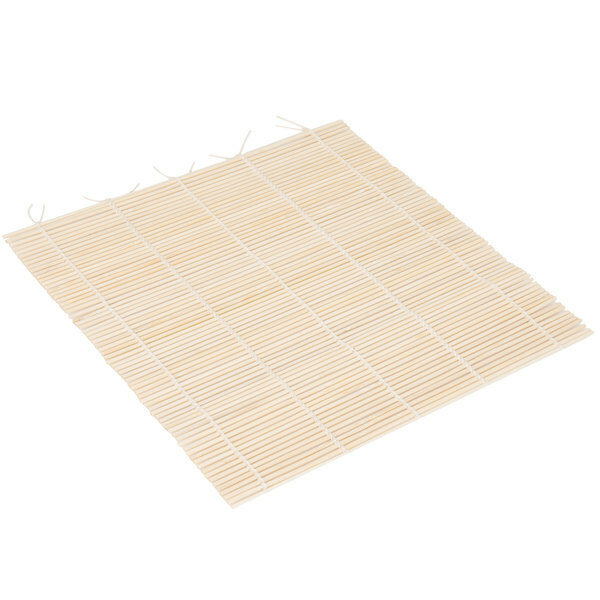 Primarily used in Japanese cooking, this makisu mat is constructed of round bamboo slats that are woven together with cotton string. While in use, the mat helps to maintain even pressure on all sides of the sushi roll, ensuring a perfect, round shape. Not only is this mat great for making makizushi, it can be used to shape Japanese omelets and other soft foods. Its ample 9 1/2" x 9 1/2" size also leaves enough room for you to make small or large signature rolls. When you're finished using it, it can simply be rinsed with hot water and air dried. It even rolls up for compact storage. 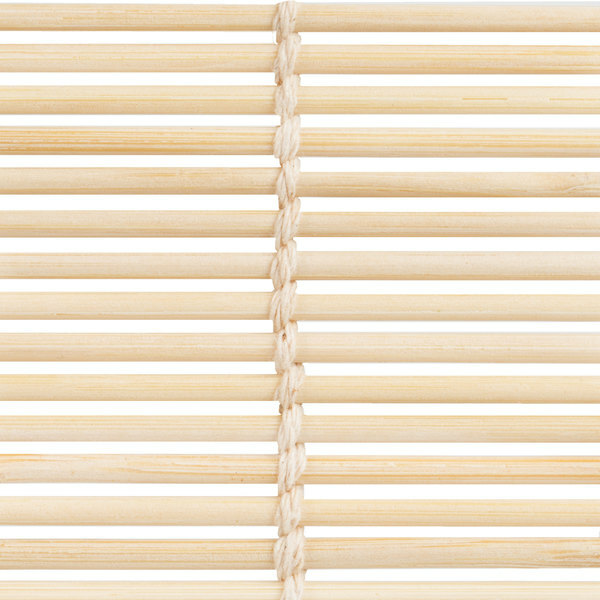 Both versatile and convenient to use, this rounded bamboo mat is an ideal addition to your restaurant, sushi bar, or buffet. Most sushi rolling mats are pretty standard. Some clean better than others and this one is fairly easy to use. I will say that these are not made to last forever and because you are using fish, it is worth replacing somewhat regularly if used a lot. Fortunately, this product is in the price range to order a handful and replace when they begin to see a lot of wear. Nice sushi mat works really good easy to handle, great size perfect for rolling sushi, the bamboo is really thicken so it rolls perfect, nice one!! bought a bundle of these for aging cheeses--perfectly adequate for the task and about as washable as can be expected. Will probably end up buying more. Quality sushi Matt to ensure sushi is a tight roll. Super easy to use and easy to clean as well. I would reccomend this to every sushi lover! 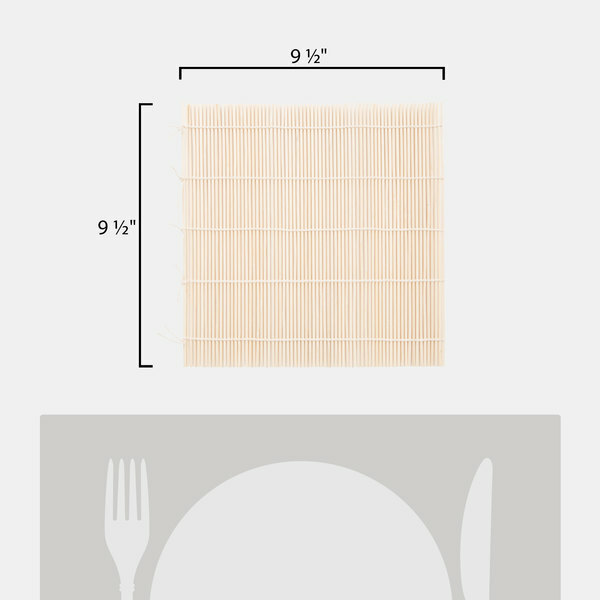 This is a really great price for a sushi rolling mat that works well and is pleasing visually. Cleans easily and is definitely worth the price. 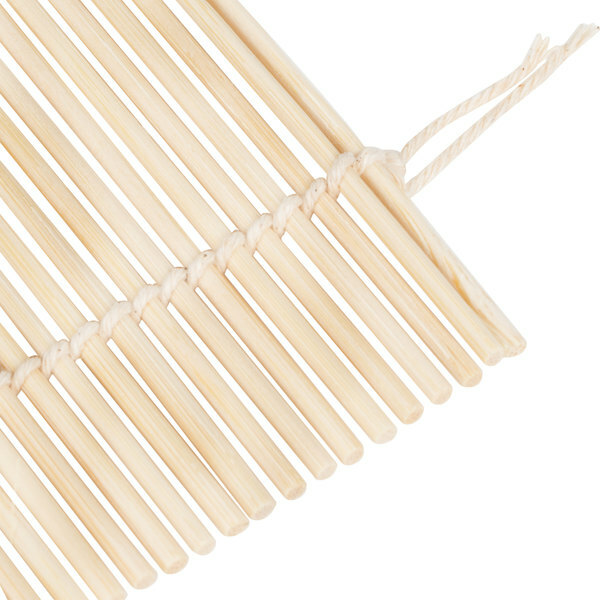 As stated by another reviewer, the gaps between the bamboo sticks are a bit wider than what I am used to but that allows some flexibility to roll out and because I use plastic wrap to line the mat anyway that doesn't seem to be too much of an issue. This nine and a half inch by nine and a half inch Rounded Bamboo Sushi Rolling Mat is better than I had expected. It is very functional and does a great job with sushi but it is also very visually appealing. It is very pretty and I would recommend. Once you get the hang of this, it makes rolling sushi a much easier task. The only thing I would like to be different is I wish it were about an inch smaller. Great useful product though. These rolling mats are a great way to mass produce or finely create sushi in many different styles. Look up Webstaurant's helpful tutorial on sushi making for how to roll! Great sushi rolling mat. This one is the basic one but it makes sushi making really easy and works just great. You will love the price too! This 9 1/2" bamboo roll matt is great. It will take some practice but I am determined to get it down! I don't like avocado, the only way I eat it is in these sushi rolls. My wife likes that part! A++ I really like these matts! 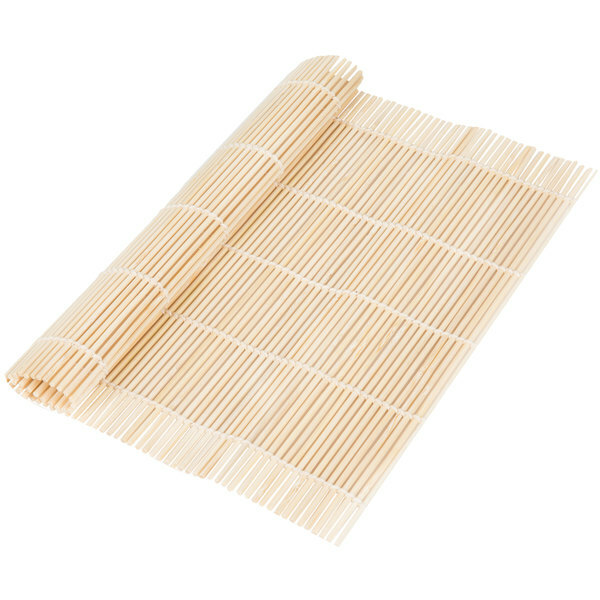 This bamboo sushi rolling mat is great and super easy to use. The durability is great when taking good care of it. The price is awesome! Nice rounded bamboo rolling mat. Nicely constructed and shipped very fast. The price was very cheap. Always a pleasure to deal with and get great products from web. This is a good product that gets the job done at a great price. While I personally prefer the other non rounded bamboo rolling mat that web offers, this one cleans up easily and does a good job. Very easy to clean, gives nice and tight rolls, it's rounded shape helps for better results, appropiate for home and restaurant use, all for a Great Price! It's a good sushi roll mat. Nice quality and perfect size for regular sushi roll. The space between bamboo not too tight and not too loose. It's a good use rolling mat. A Sushi Mat which compliments the decor as well as the task of Sushi Making principles at any stage of Sushi Making prowess, a must have for any SUSHI entrepreneur. The first thing I noticed about this rolling mat is that the bamboo pieces aren't very densely laid out; there's a good amount of space between them. Now, I don't know if this quality necessarily is a bad thing. I just used it, I've used more "dense" mats in the past, and I didn't feel like there was a significant decrease in effectiveness. It did feel less tight and I do admit that it felt a bit more flimsy. When the mat was wet, the smell did verify that it's bamboo. The string that holds it together is a little stretchy. Gets the job done. Excellent and super inexpensive solution to rolling your own sushi and look like a total pro. Sushi rice, along with the fillings of your choice and this mat, and you'll be making beautiful edible works of art. Good value for the product. Very straightforward product, that aids culinary students who are unfamiliar with sushi preparation or the pro that prepares sushi all day. Purchased this item to supplement my culinary kit. 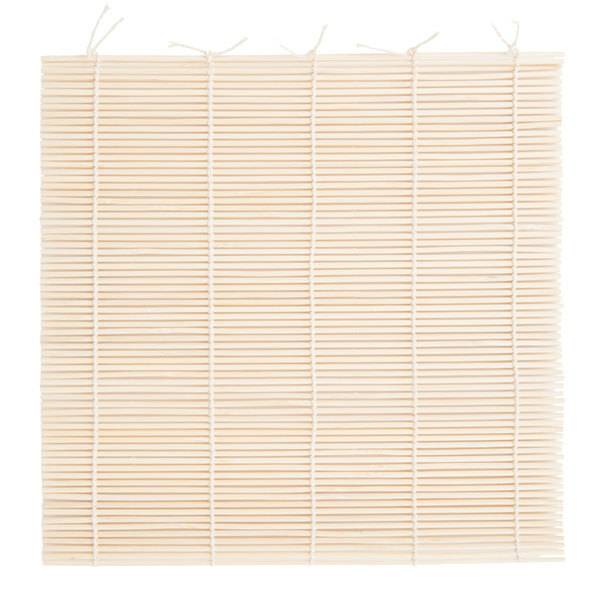 This is a great bamboo mat for making sushi at home. I love making vegetarian rolls for a quick little snack. Easy to wipe clean and maintain. A neat tool to slip in any knife roll.